Within the past couple of months I have received four copies of four different editions of the corrected English translation of the Roman Missal for review. Now evidently the intent here is not to review the actual text of the Missal itself; that is what it is. 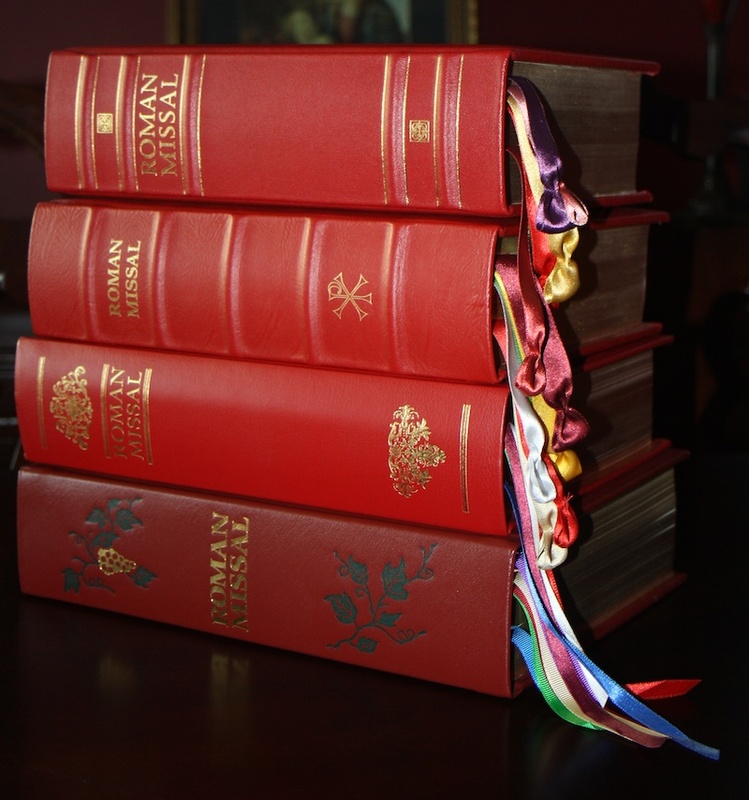 Rather, the intent is to look at these missals from the perspective of the "book arts"; which is to say, to look at them in terms of their quality and beauty and with a specific consideration to our tradition of liturgical book publishing. As such, the intent will be to consider elements like the binding, the external design and ornamentation, ribbons, tabs, interior art, typography and so on. The intent as well is to consider these simultaneously and comparatively, both in relation to one another, and with reference to some of our traditional missals. Due to the scope, a singular post could quite quickly get out of hand and so I have determined to separate this review into two -- possibly three -- installments. Today's portion will give consideration to the binding itself. The next installment will focus more on interior aspects such as typography, art, page tabs and ribbon markers and so forth. I will be forthright from the outset that in each instance I see strengths and weaknesses. My intent here is not to declare a 'winner', but rather to identify the particular strengths of each particular missal, as well as identify those aspects which I believe are weaker. A part of my hope is that such a review may also provide constructive food for thought for these publishers, should they put out another edition in the future. 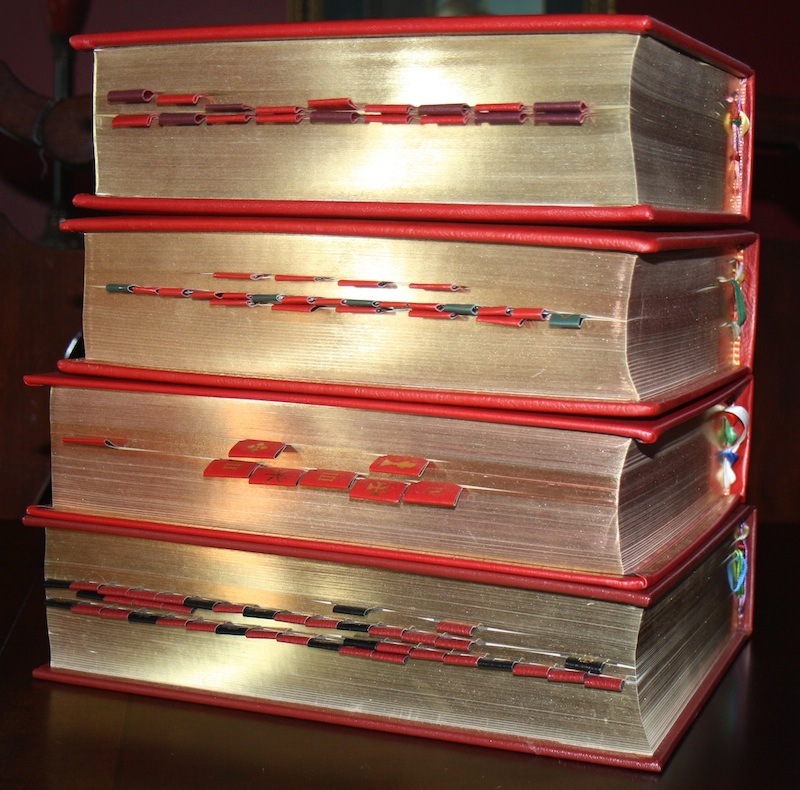 Our tradition of liturgical book binding in the Latin rite has produced some exquisite works of sacred art in its own right. Indeed, it might be one of the most unsung aspects of our treasury of liturgical art for reason that is has been more hidden from general and popular view than say a vestment, a painting, the architecture or sacred music. That being said, one of the critiques that has arisen since the time of the implementation of the liturgical reforms in the mid 1960's has been that the quality of our liturgical books has significantly declined. To some extent this may have been a sign of the aesthetic of the times, but surely as well there is another explanation; as the liturgical rites were revised and revised, there was an instability introduced with regard our liturgical books that would hardly foster the necessary investment of time or resources required for publishers to produce something of high quality -- a production which might find itself being revised within only a short span of time thereafter. 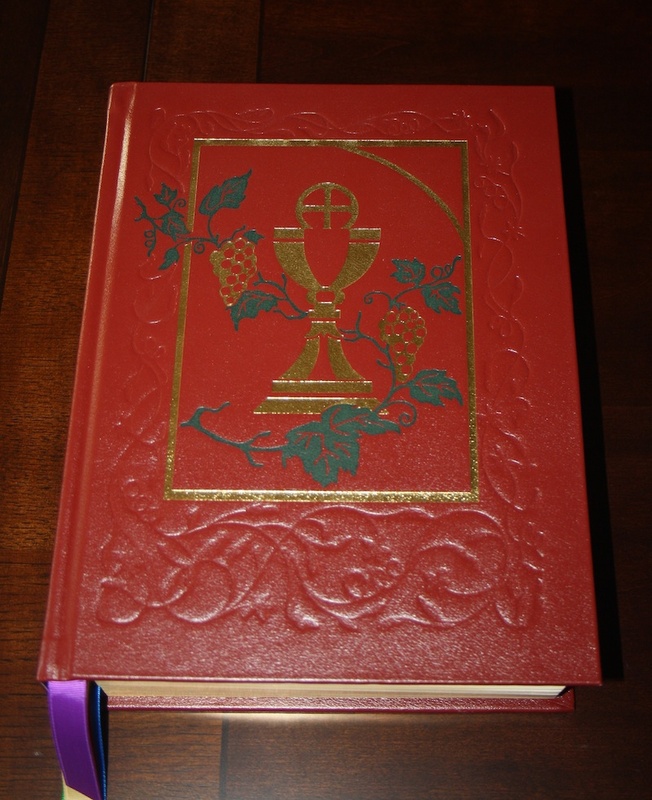 While that is understandable from a publishing perspective, the unfortunate fact was that as the post-conciliar liturgical reform settled in, it would seem that the quality of our liturgical books did not significantly re-assert itself. Instead, it seems that the bar remained where it had been set within that era of instability -- namely, rather low. So then, where do we find ourselves today, sitting now at this latest edition of the Pauline Missal? My overall view is that we have taken some definite steps forward, though we still have further yet to go -- which is pretty well what one could say with regard to all the other liturgical arts as well. We are in a process of recovery -- and it is a process. 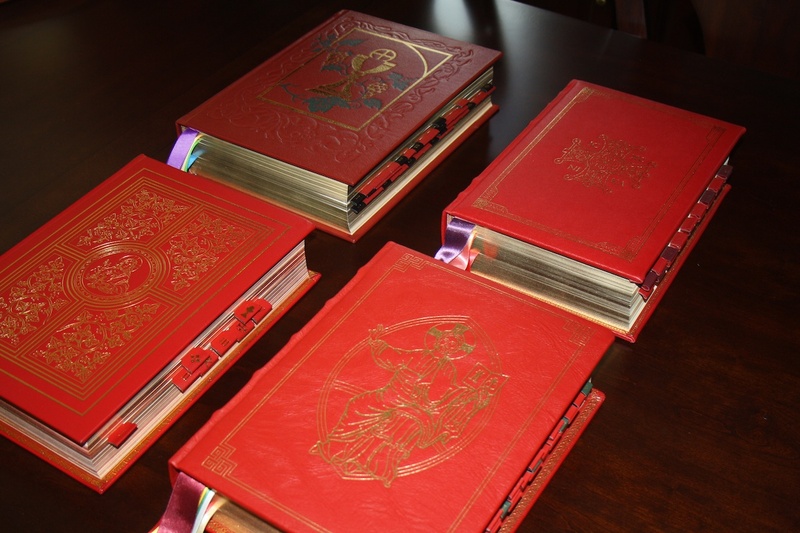 All four bindings for these particular editions are comprised of genuine leather, and this is certainly a marked improvement from much of what we have seen within the past few decades. Putting aside matters of design (which I will address momentarily), I find the WLP and Magnificat editions most satisfying from the point of view of the construction of the front and back boards; namely, the way the leather is applied to the boards and how the deeply the cover designs are embossed or "tooled" -- though there is room for improvement here too however. In the instance of the CTS and MTF editions, I think their covers would have been better served if the cover designs had been more deeply tooled and further had they not chosen to use padded covers -- for those who wonder what I mean by this, essentially the leather has a padding underneath of it making it "squishy" or "soft" to the touch. (The most familiar comparison I might be able to give here is to the way some large family bibles were published in the modern era.) Speaking for myself, while I otherwise quite like other aspects of their particular end product, my own judgement is that these two aspects take away from the overall quality and sturdiness these editions exhibit otherwise and I believe it could potentially make the covers and their respective designs less durable over time as well. None of them employ a polished leather cover which can really set a missal apart. All that said about the construction of the front and back boards, my take on the spines is quite the inverse. To their credit, each publisher has attempted to include some measure of decoration. Of these four, I believe the WLP edition is the least successful. The text on the WLP spine comes across as rather clumsy, both in size and placement, and the designs on the edge come across as a bit of an afterthought, as unfinished, and of course, they lack symmetry and order. The sense I receive from them is not what I'd expect for a liturgical book personally, but rather something more folksy in nature. The Magnificat edition includes a very nice font for the titling and is coupled with some nice designs on the spine, though I personally believe that they would have been better served had they included raised bands on the spine. This would have complimented nicely the very beautiful and ornate cover design on their front and back covers. While the tooling on their cover is decent, the tooling on the spine seems to be lacking. Still, the end result is not unattractive; it is merely just a bit disappointing, particularly given the strengths of the front and back boards. The MTF edition has, in my view, gotten the raised bands right, and it certainly provides a visible connection to what was very typically seen in traditional book arts as a result of traditional book construction. What their edition might have benefited from is some gold linear outlining of those raised bands as was often traditionally done. This tends to make the book have a more finished and neater overall appearance, while also adding a little extra detailing that beautifies and ties it into the bordering on the cover itself. The font for their titling is quite good and well proportioned and the use of the Chi-Rho design is also nicely done and nicely proportioned. As noted above about the front and back boards however, what is lacking here is the depth of the tooling. Still, very nice all said and very pleasing to look at. Finally we come to the CTS edition. The spine here is also very nicely done, including some raised bands. My only thought here is once again about the tooling, and further that the raised bands would be improved if they had equilaterally spaced the raised bands down the entire spine, similar to what we see in the MTF edition. You will note, however, that they do use the gold linear outlining on the upper and lower edge of the raised bands and this works very well. The font used for the titling is very crisp and als works very well, though I believe the two small designs do not add a great deal; simple Greek cross designs might have been more effective and attractive. Overall a very successful effort however. Taking all in all, I find the MTF and CTS spine designs the best of the four. Turning the page edges, each of these publishers have done an excellent job in having the exterior edges of the pages gilt in gold, and while this can be difficult to capture in a photograph, I can tell you that each publisher seems to have done an excellent job. This photo does not do any of them justice. My final consideration for this first part will be the cover designs themselves, of which I am also considering the interior extension of the leather cover. By cover design, I am referring of course to the actual designs and not the considerations already given regarding the gold tooling or the leather work. Let us begin with the MTF edition. The MTF edition includes a front cover design which includes a border design and a traditional iconographic representation of Christ the Pantocrator. Speaking purely as a matter of personal preference, I would probably prefer something a little more typical coming from our Latin rite Missal tradition, but that said, the design is itself not without beauty and dignity, and certainly there is also room to expand and develop upon this tradition -- after all, missals were ornamented with everything from crosses, ecclesiastical heraldry, to purely organic designs. There is no singular, "correct" design in that regard. 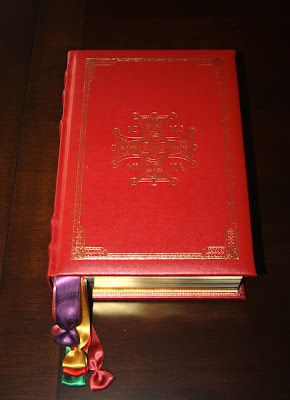 The back cover of the missal heralds a beautiful Chi-Rho design which is very well done. 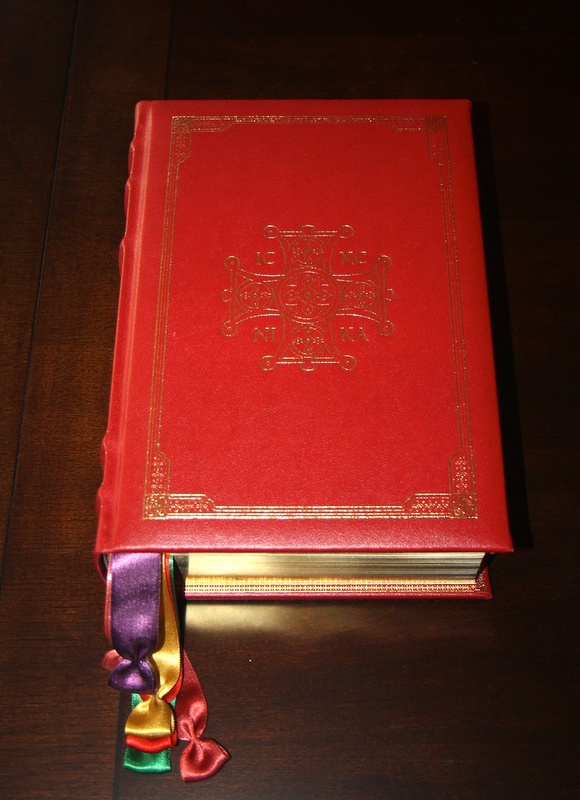 The use of the borders on the cover is very well done and I would make particular note of how the gold gilt designs extend onto the leather that is visible from within the interior of the missal. This is extremely well done and, in my estimation, the best of the three that incorporate this. Next, we look to the Magnificat edition. 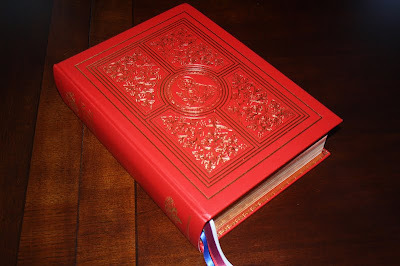 Of the four missals, the Magnificat edition certainly has one of the most spectacular and striking cover designs. I frankly think that the design and its beauty speaks for itself. It is well balanced, symmetrical and includes a design of Christ at the Last Supper on the front (Chi-Rho on the back) with a vine and the branches theme within the four panels -- which also make up a cross design as well. Spectacular design. 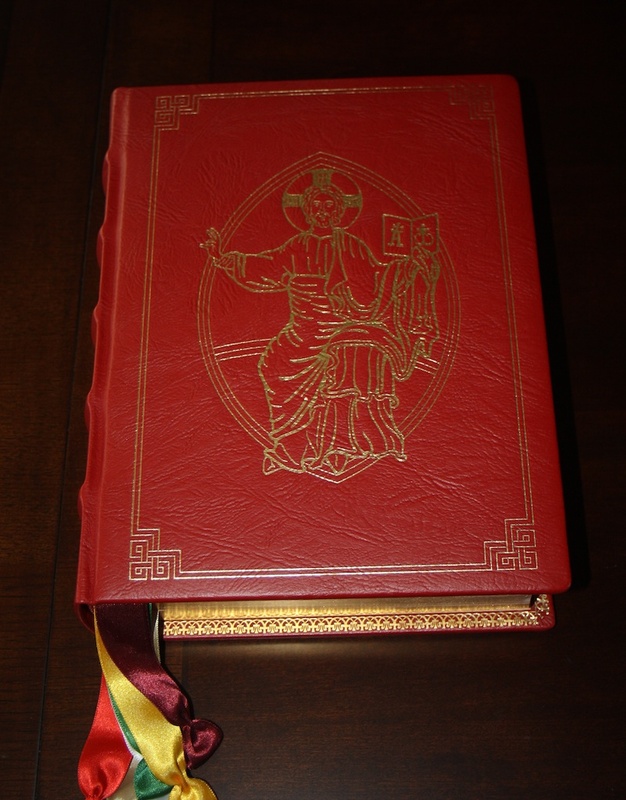 As with the MTF missal, this edition also carries over the gold gilt design to the inner portions of the leather, and this is also very well done. The WLP edition cover, while having the strengths of the deeper tooling I already mentioned, is the weakest cover design in my estimation -- though I will have to say that the final product is done far more justice than the WLP images on its website would make it appear. My main thought here is that the cover would benefit from a greater symmetry and sophistication in its design. While I appreciate the idea of using more than just gold gilding in the cover design (which I have seen done to great effect in some historical missals), I think the design comes across as unfinished and perhaps too folksy in style. That said, the outer vinework designs are quite nice in their own right and are what struck me most positively about the cover. If they had been tooled in gold, it would have been that much better. We finally turn to the CTS edition of the missal which is that which is probably most familiar to many of our readers. This particular cover design is also very nice and very striking. It bears an ornamental Greek cross with the Greek Chrisogram "IC-XC NI-KA" -- meaning "Jesus Christ conquers." The use of a border is likewise a very good inclusion on this design, as is the extension of the gilt design to the interior leather work. A simple, beautiful and striking cover design. To summarize then, each edition has its relative merits and weaknesses in my estimation. If I could pick and choose this or that element from each bindings here presented, I would end up with the sort of missal binding that I would probably myself design. As such, while I cannot say that I find any particular one of these bindings to be a clear or overall favourite, I can say that taken in view of the cover art, the Magnificat and CTS editions would be where I would tend; however, taken in view of the overall binding in all its aspects, I would probably tend toward the MTF and CTS editions. 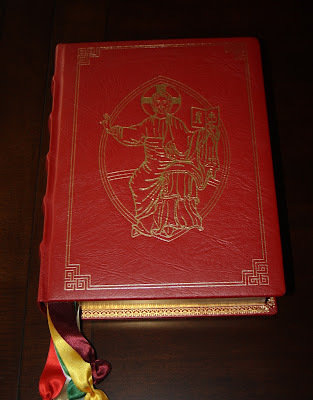 However, we cannot judge a book, or a missal, only by its cover, and so in my next installment I will turn to a consideration of the interior aspects of each of these missals.